I had a strange dream a few weeks ago, that I accidentally backed my car into the garage of a mafia group, and to make me pay for the damage, they kidnapped me and forced me to bake treats for them. I don't remember much else about the dream, but I will say, being forced to prepare desserts really isn't much of a punishment for me. One of my coworkers, after hearing the dream, declared that he might kidnap me so that I would have to make him one of my cheesecakes. There are worse things, wouldn't you say? 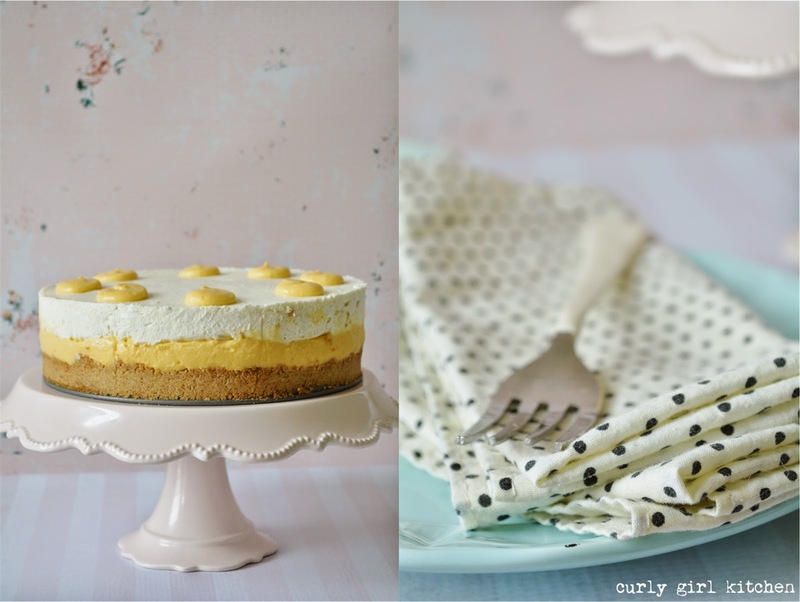 You may have noticed that I love stripes and polka dots, and when I can incorporate them into dessert, even better. 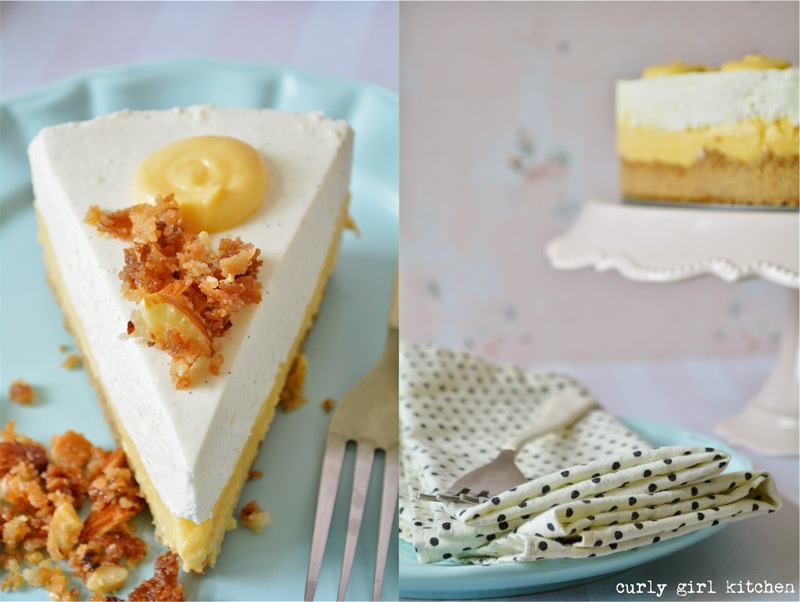 I started with a layer of salted graham cracker crust, followed by creamy mango custard. 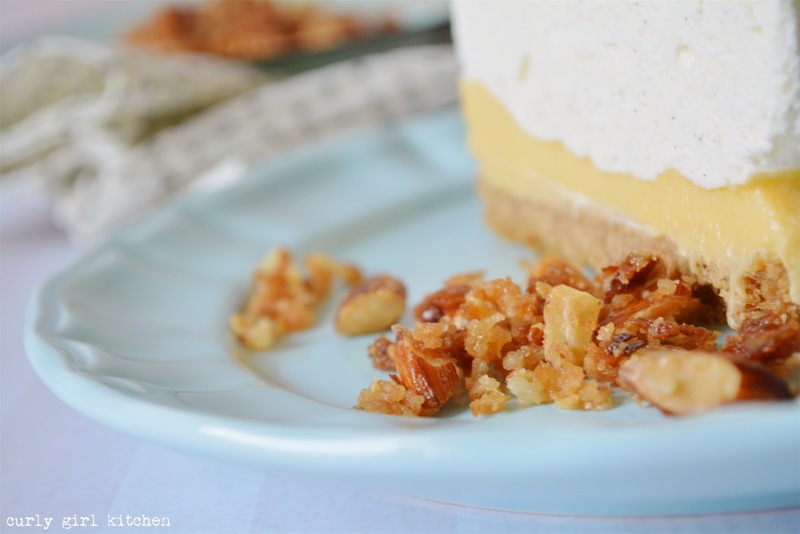 To finish, a rich vanilla bean cheesecake, my favorite no-bake version that's so silky and luscious. 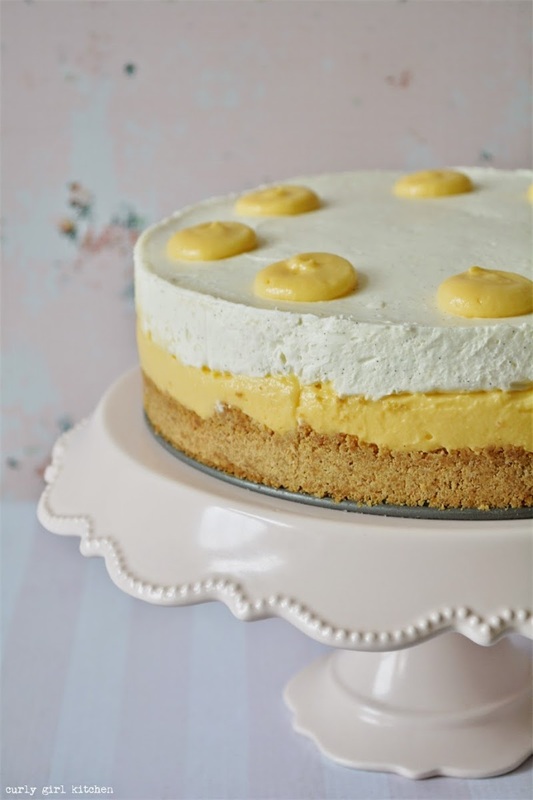 The specks of vanilla bean throughout the cheesecake hint invitingly of the pure vanilla flavor, and dots of mango custard on top are a playful touch. For a little texture, I also made an almond crumble, that melts and hardens into more of a brittle when it's baked. 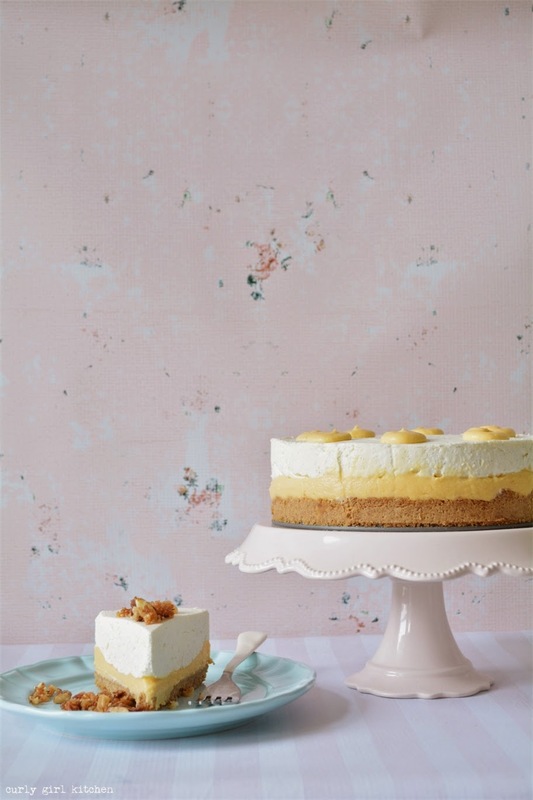 It's salty, sweet and crunchy, the perfect topping for the creamy cheesecake and custard. 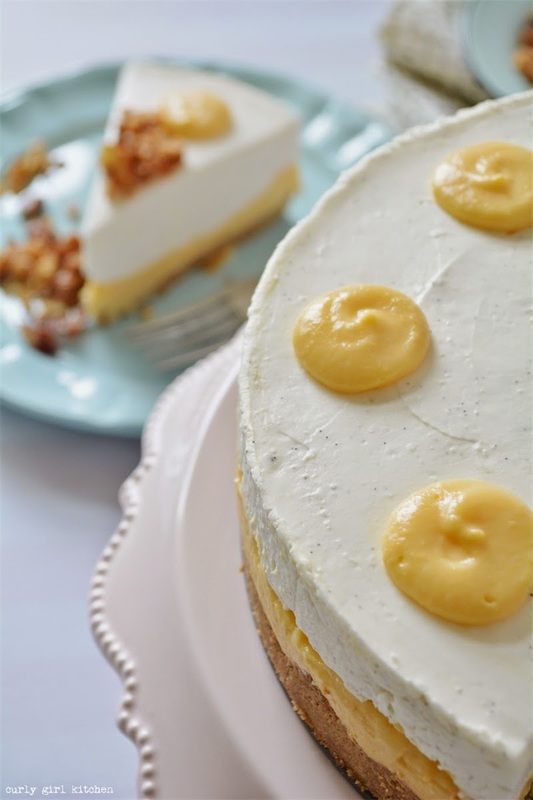 The mango flavor adds a slightly exotic touch, but if mango isn't your thing, I was thinking that the custard would also be fantastic with bananas instead, for a cheesecake that's a more elevated version of a childhood favorite, banana pudding. 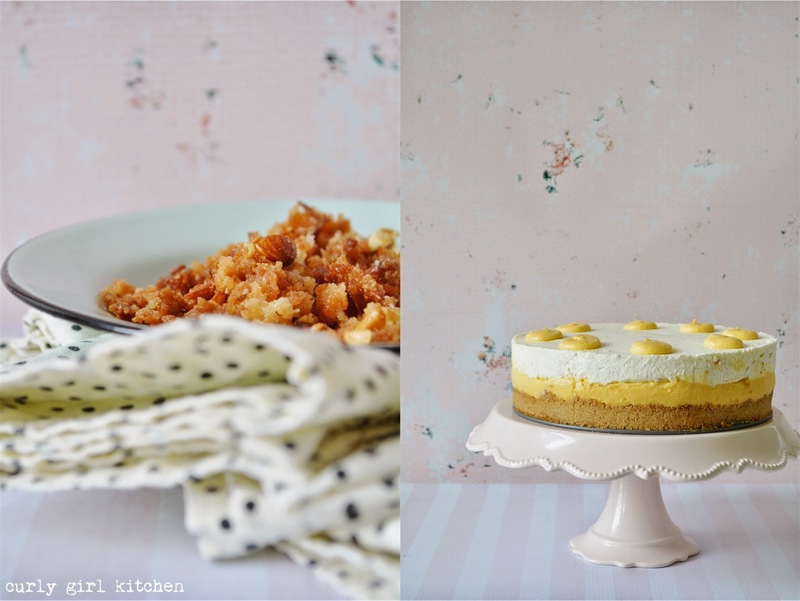 And everything is better with crumble on top. In a blender, puree the milk, mango and cornstarch until smooth. Pour into a saucepan. Bring to a gentle simmer over medium heat, whisking occasionally. Whisking constantly, bring the custard to a boil over medium heat, then cook for 1-2 minutes until thickened. Remove from the heat and whisk in the vanilla and the butter, 1 tablespoon at a time, until smooth. Pour through a mesh strainer into a bowl, cover with plastic wrap right against the surface of the custard and refrigerate until thoroughly chilled, preferably overnight. In the bowl of your stand mixer fitted with the whisk attachment, beat the remaining 1 1/4 cups cream with the vanilla bean seeds at medium-high speed until soft peaks form, gradually adding the powdered sugar as the cream thickens. Add the cream cheese and gelatin mixture and beat until smooth and thick with no lumps, about 2-3 minutes. Spread the chilled mango custard over the crust, reserving 1/2 cup of the custard. 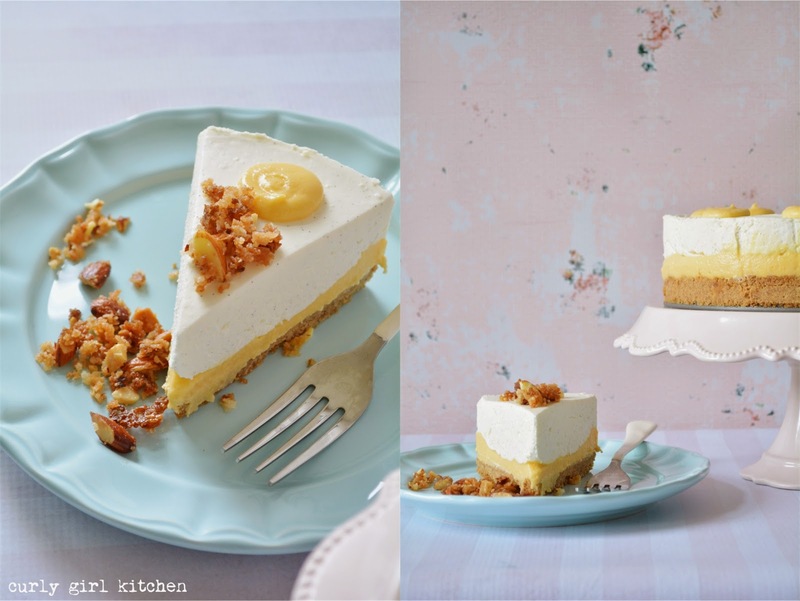 Immediately spread the cheesecake over the custard and smooth out the top. 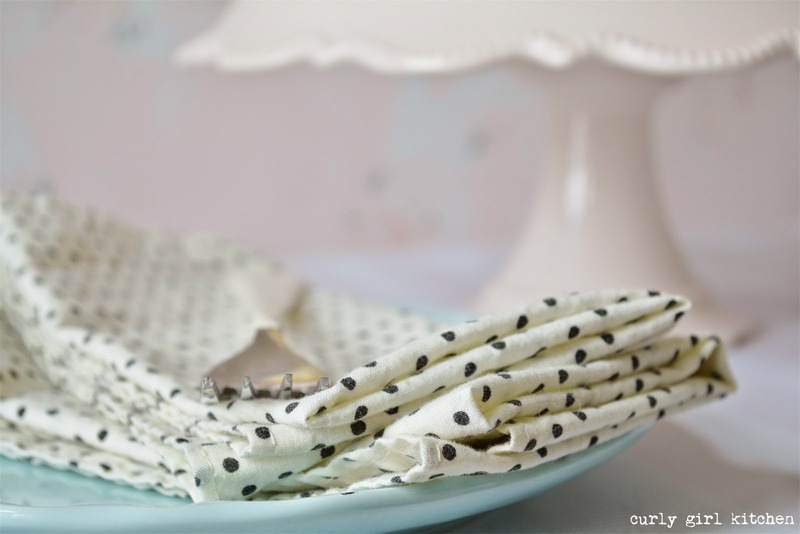 Fill a piping bag fitted with a small round tip with the reserved 1/2 cup custard. 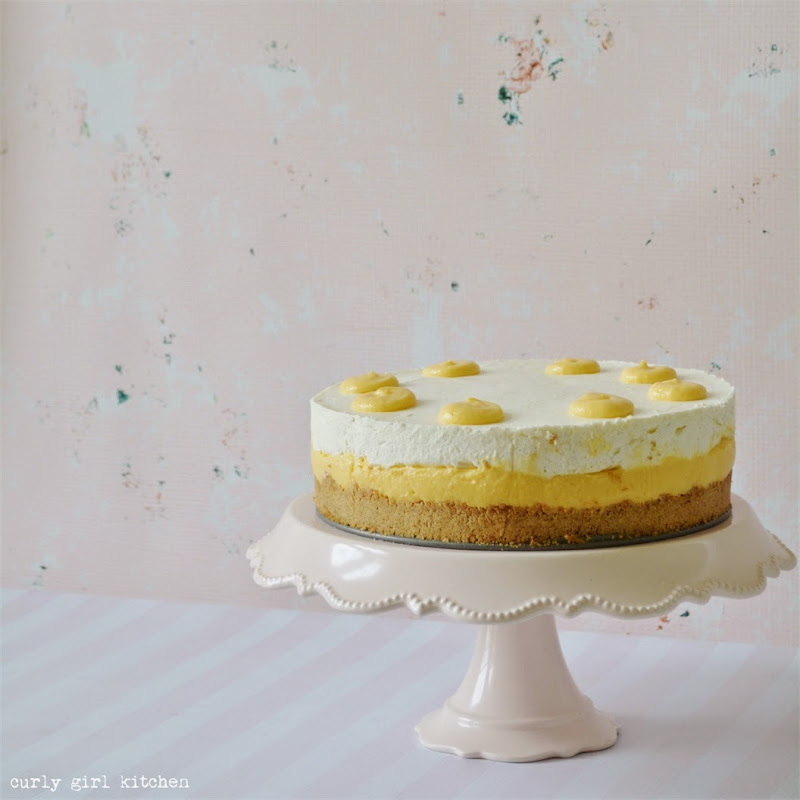 Pipe dots of custard on top of the cheesecake. Cover loosely with plastic so as not to disturb the top, and refrigerate for 4-6 hours, or overnight. In a bowl, combine the almonds, flour, sugar and salt. 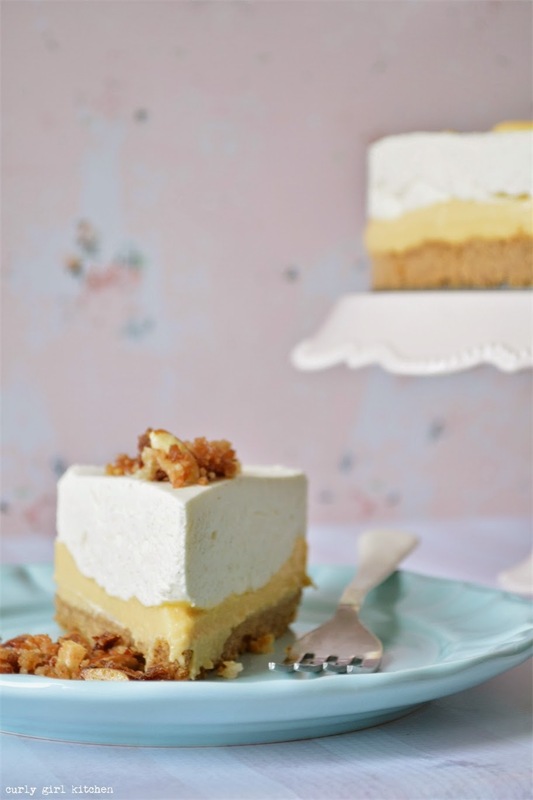 Use your fingers to rub the butter into the mixture until moist and crumbly. Freeze for 20 minutes. Spread the crumble into a parchment lined baking sheet and bake at 375 for about 5-7 minutes, just until golden brown, watching it carefully so it doesn't burn. Let cool for a few minutes to harden, then crumble into pieces. To serve, remove the sides of the pan and top each slice with the crumble.